The Oscar category for Best Foreign Language Film often includes interesting, hot-button cinema. The film designated as each country’s choice for their best in film all year long gets a second chance to be received in a whole new way in the United States when it is exposed to Oscar voters and the moviegoing public. “Omar” is significant because it is only the second Palestinian film to receive that honor, and comes from the director of the first, “Paradise Now,” Hany Abu-Assad. Resistance against Israel is still a main plot point, but this film feels markedly different, in a less productive way. “Paradise Now” was a stark tale of two Palestinian suicide bombers preparing for an attack on Israel. That film produced plenty of controversy, yet was ultimately seen by many as a contemplative and thought-provoking look at a deeply moral issue. Abu-Assad returns now with another story about Palestinians itching to revolt against Israel, yet from a more humanly connected perspective. Omar (Adam Bakri) climbs over the wall separating his life on a regular basis, meeting with his friends Tarek and Amjad and courting Tarek’s sister Nadia. With his friends, Omar scouts out an Israeli base, where Amjad shoots and kills an unsuspecting soldier. Pursued by police, Omar finds himself apprehended and forced to consider the unthinkable: cooperating with Israel to ensure that he does not spend his entire life in prison. It’s interesting to look at “Omar” alongside “The Green Prince,” a documentary screened at the Sundance Film Festival that tells the true story of the son of a Hamas leader who became an informant for Israel. Neither film achieves a real sense of clarity or the intentionality behind either side’s actions, yet there is a crucial disconnect between the two. 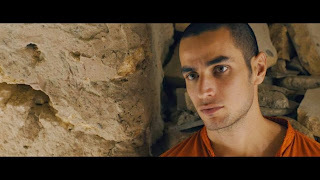 “Omar” deals extensively with the aftermath of incarceration and the tension that builds from others believing that a recently released arrestee might be a traitor. Mosab Hassan Yousef, the subject of “The Green Prince,” describes the way in which imprisoned criminals tortured and killed suspected collaborators as a key factor in why he chose to switch sides, since, to him, it was just as abhorrent as the perceived imperialist actions of the Israeli government and police. “Omar” does not search for morality or evenhandedness, and instead constructs itself as a romantic story of love and devotion. Omar is equally committed to the idyllic life he plans to lead with Nadia, should Tarek accept his forever delayed request for her hand in marriage, and to the cause of resisting Israel. When undercover cops bursts onto the scene, Omar excitedly runs away, seemingly bringing the hope and spirit of his struggle with him every time he manages to cleverly evade the hapless Israeli police. As the film progresses and the situation turns much more dire, its events become even more unpleasant, yet its attitude towards the conflict is still disappointingly one-dimensional and negative. Its newcomer lead performer is excitable and involved enough, but this story is bogged down by an obsession with cyclical misery and violence that leads nowhere positive.